Last week I spent a day with two friends from Colorado who were visiting New Jersey. 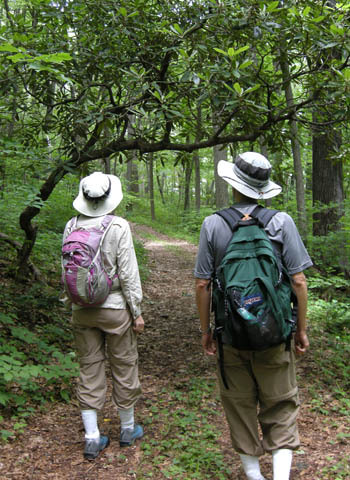 But instead of going to a restaurant or museum, Julie and Jarett suggested we meet up for some hiking and a picnic lunch at the Mariton Wildlife Sanctuary. That was perfect. Conveniently located on the Delaware River outside of Riegelsville, PA., Mariton was not that far for either me, just north of Philadelphia, or for my friends who were staying in western New Jersey. 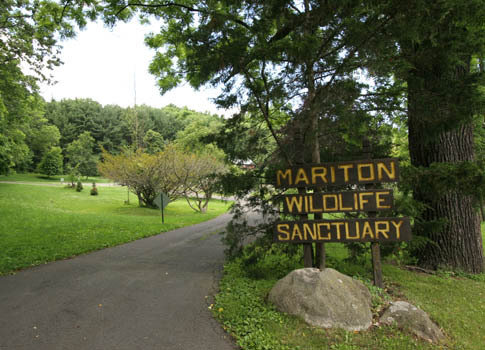 Mariton Preserve is a 200-acre tract, which in 1969 was placed by its owners under the protection and management of the Natural Lands Trust. 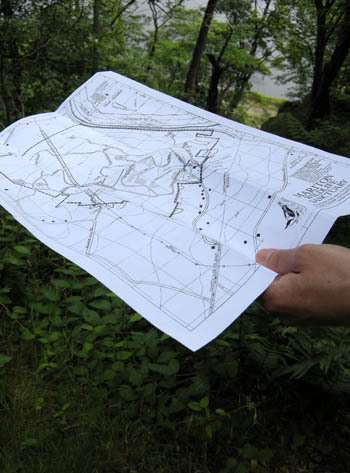 The Lands Trust has been around since 1953. It has devoted itself, either through acquisition or conservation partnership, to protecting and managing land throughout the Delaware Valley. Mariton has a wonderful visitor’s center with displays of bird and animal skulls, nests, photos, bones, feathers, stuffed birds, and rubber casts of animal tracks that you can press into a small sandbox to see what the imprint of a bobcat or snapping turtle might look like. Mariton also offers workshops and nature tours for school groups and other visitors, but last week the three of us had the entire place to ourselves. Not a car or school bus anywhere in the parking lot. 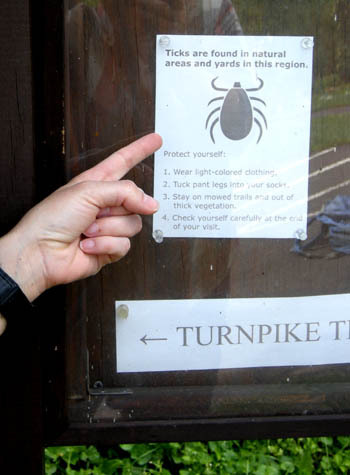 During tick season it’s a good idea to tuck pants into your socks. 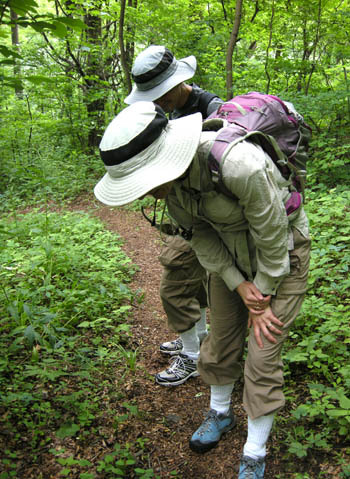 The trail map offered 4-5 miles of hiking paths. We decide to plan for lunch at River Overlook, check out the bird blind on the way, and after lunch hike up South Fox Trail to Kit Trail, which leads down through a coniferous forest where we might spot roosting owls. 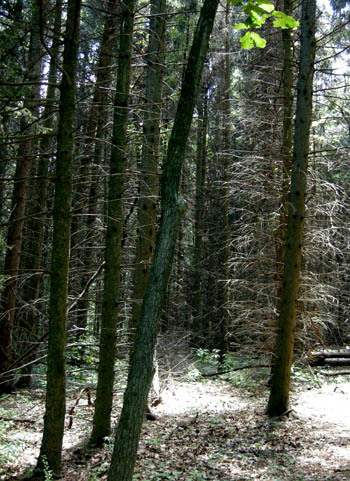 On the trail map this pine forest was called ‘The Dark Habitat’. Now, anything named ‘The Dark Habitat’ is just begging to be checked out. It makes you wonder what else might be roosting in those spruce trees along with the owls. Julie and Jarett, being Tolkien freaks, referred to it as “Mordor”. So it was a must. Owls or no owls, how can you resist traveling through Mordor to get back to your car? Note the pants tucked into the socks. 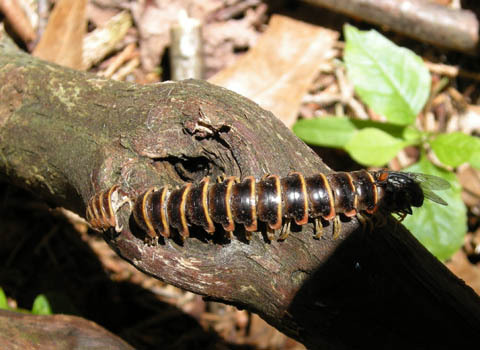 Two things strike me about Pennsylvania forests, even though I have been back east now for 8 years. One is the absolute greenery, and the other is the intensity of bird sounds. It’s not that there aren’t lots of birds in Colorado, but their calls can seem distant in the open lands. 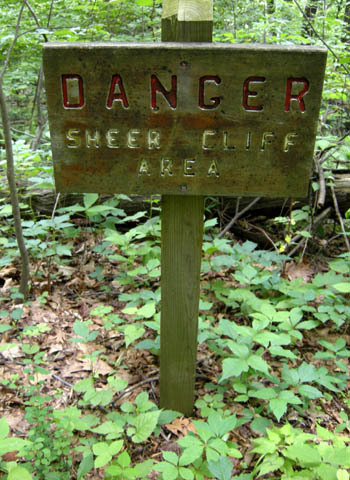 Whereas, the dense forests back east contain bird sounds and bounce them back at you in a heavy dose. While a Steller’s Jay is a grand sight to an easterner, so is the Northern Cardinal to a westerner. Julie and Jarett were enthralled with the bright exotic red of these birds, as I continue to be. In fact, throw in a few scarlet cardinals among the deep and luminescent greenery of a deciduous forest, and the surround sound of bird songs and screeches, and squirrels chattering overhead like monkeys, and a bit of east coast humidity, and you have yourself a Pennsylvania jungle. A Rhodedendron reaches over the trail and gives the forest an exotic touch. No jungle is complete, however, without some large prehistoric-looking bird. For the Mariton woods it was the Pileated Woodpecker which fit that role. Julie was hoping to see one. Pileateds aren’t found in Colorado, and they aren’t even that easily come upon in Pennsylvania, but the forest here had the mature hardwoods that these birds like. Sure enough, a black blur, the size of a football, cruised through the trees and landed on a the trunk of a beech tree where it lingered long enough for all 3 of us to pass the binos around and enjoy a nice long look at this magnificent bird with its red crest illuminated by the sun. 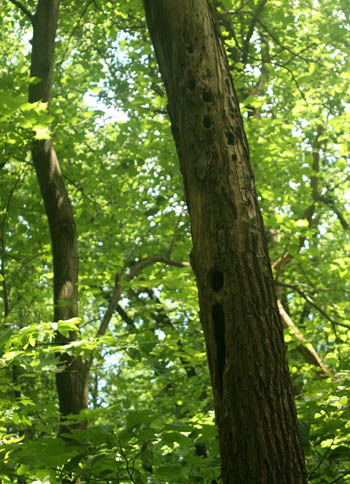 Pileated Woodpeckers make holes that are easily identified because of their large, rectangular shape. We had a change of plan when we got down to River Outlook; there was not much room to sit and the view of the Delaware below was obscured by foliage. Perhaps, in the fall the view might be better. River Overlook sits right above the Delaware River. Since we had missed the bird blind somehow, we back-tracked to find it and eat lunch there. That turned out to be good move. 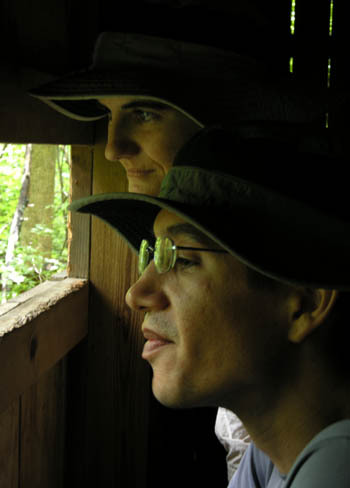 We could eat and be entertained by fledgling birds and cheeky young chipmunks. Young critters keep us entertained. The feeder area was like a day care for woodland youngsters. Young Eastern Chipmunks plowed their little noses through the dirt, seeking out seeds, while juvenile northern cardinals pecked at anything with potential for tastiness. The cardinal parents supervised from nearby bushes. 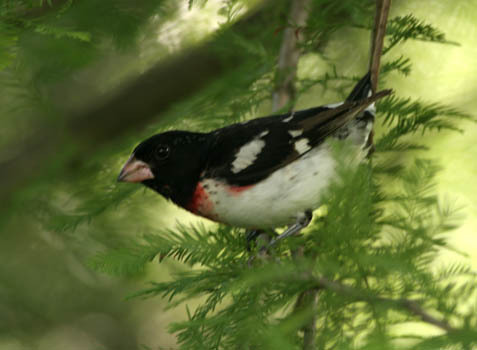 A male Rose-breasted Grosbeak makes an appearance. When we came upon the Trees of Mordor, we were horrified by their condition. Branches, barren of needles, conjured up images of some East Coast pine beetle infestation, like that which is so prevalent in Colorado. No sun means no needles. 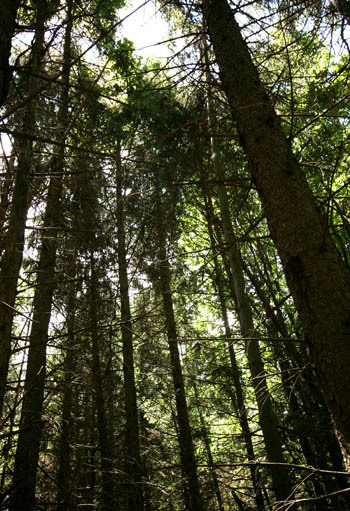 But an information plaque informed us that the spruce were originally planted close together as part of an early tree plantation but none of the spruce were ever culled to create space between the trees so that sunlight could reach the lower limbs. As a result, the trees ceased to support a lost cause and diverted their energy towards the upper and outer branches, which were a nice healthy green. The Trees of Mordor live. 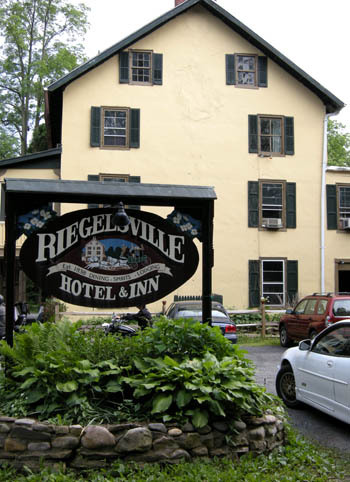 For an early dinner, Julie, Jarett, and I went to the Riegelsville Hotel and Inn (est. 1834) where we ate on the back patio, behind which runs the 60-mile long Delaware Canal. 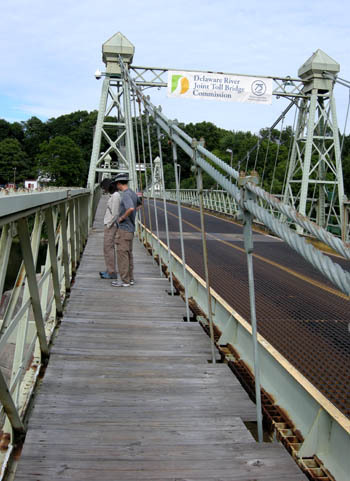 Had we been eating our salad and fries and key lime cheesecake on the patio in the 1830’s or 40’s we could have also enjoyed watching boats pass by hauling iron, coal, stone, and goods from the mills on the Jersey side of the river. As it was, we had to content ourselves with the less quaint view of joggers, people on bikes, and families walking kids and dogs. Meanwhile, we compiled our bird sightings from Mariton Preserve and came up with 25 species that we could positively identify, and happily, that included our Pileated Woodpecker. If you ever want to work off dinner after eating at the Riegelsvill Hotel and Inn, you might consider a walk to New Jersey and back. 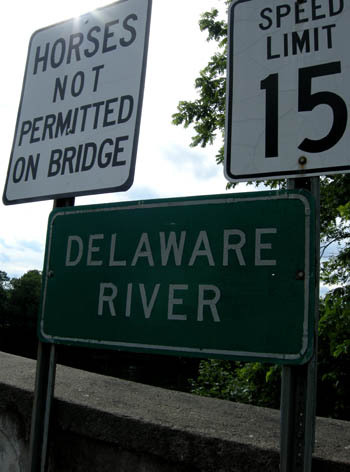 That’s what we did, crossing the Delaware by way of the PA-NJ Joint Commission Toll Bridge. An after-dinner stroll out of state. 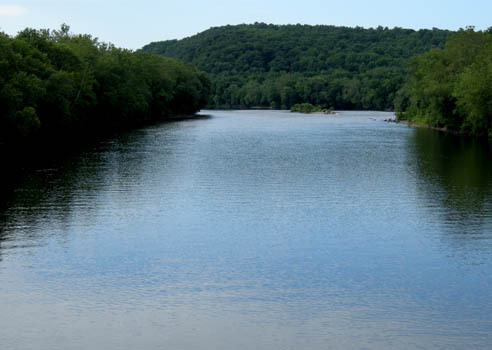 The Delaware River looking north. After about 5-7 minutes standing in NJ we moseyed on back to Pennsylvania, where we said our good-byes, reaffirmed with each other what a great day we had and wasn’t it cool that we saw that Pileated Woodpecker. 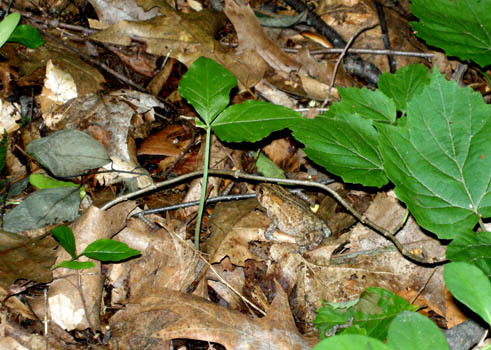 Can you find our favorite little resident of Mariton Preserve?